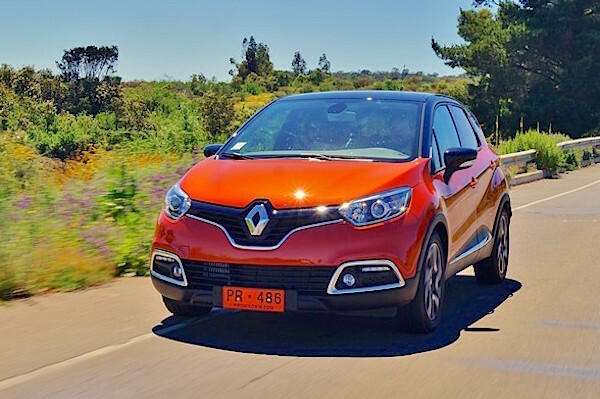 Renault has just launched the Captur in Chile. The Chilean new car market accelerates its fall in August at -21% year-on-year to 24.374 registrations, bringing the year-to-date total to 177.114 units, also down 21% on 2014. Chevrolet keeps the lead despite a market share frankly below its year-to-date level at 11.2% vs. 12.8%, while Hyundai overtakes sister brand Kia for a mere 5 units at 2.408 vs. 2.403, both brands holding just under 10% of the Chilean market. Suzuki (9.5%), Nissan (7.7%) and Toyota (6%) follow as per the YTD order, whereas Renault shoots up four spots on July to land in 7th position with 1.049 sales, potentially helped by the launch of the Captur crossover. Fiat shines at #12 and 2.9% share vs. 1.7% YTD, while Great Wall (#16) leads the Chinese force ahead of JAC (#18), Chery (#19) and ChangAn (#23). All-in-all, Chinese carmakers represent 9.2% of the Chilean market in August vs. 8.5% year-to-date. Full August 2015 Top 60 All-brands Ranking Table below.